My family has had the chance to work through the newest study put out by Grapevine Studies: The Life of Joseph. Intended for ages 7 and up, it has actually worked quite well for all the kids, ages 5 through 14. I reviewed another Grapevine product a couple of years ago, and we found that stick-figuring through the Bible was really a lot of fun. And the kids learned a LOT. I kept meaning to get another study to work through, and somehow, that just never happened. Walk with Joseph as he goes from a prince in Canaan to slavery in Egypt and then to the courts of Pharaoh. Your students will enjoy this engaging Bible study! Follow Joseph as he travels from the tents of Jacob to the house of Potiphar and eventually becomes second in command to Pharaoh. Watch to see how Joseph reacts to slavery and false accusations. See how God uses difficult circumstances in Joseph’s life to prepare him to save thousands of people, including those who mistreated him. Joseph’s story is one of betrayal, forgiveness, and restoration. Take a look at this fascinating Bible story today! 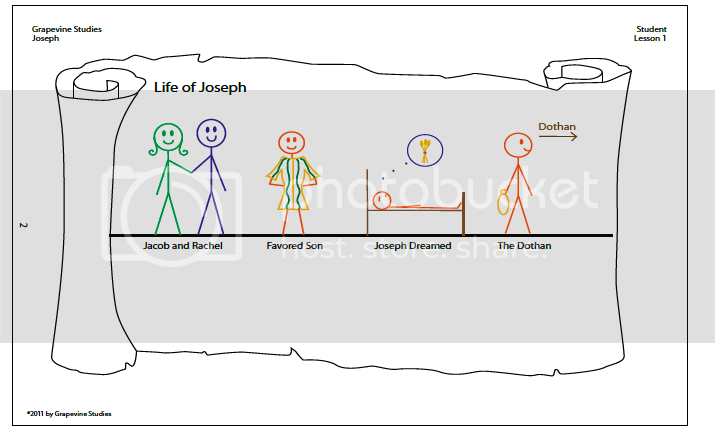 After that, you step back and start over, getting a lot more detail about each of the key events in Joseph's life. 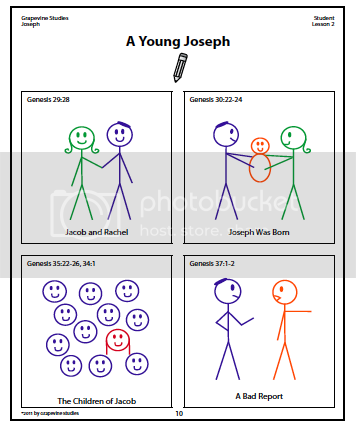 The first lesson focuses on a young Joseph. You complete one page a day, for five days (or do it all as a Sunday School lesson, which is closer to what we did!). The first day, you read four verses from Genesis and discuss Jacob and Rachel getting married, and Joseph being the first-born son of theirs. You start working on a memory verse (Gen. 30:24 in this case). And... the part that made this work for my older kids... you look words up in a Bible Dictionary. Words for lesson 1 included such things as reproach, sheaves and rebuked. The second day, you read another few verses and discuss Jacob's children, and the fact that Joseph gave a 'bad report' to his father about his brothers. This day also has the kids doing some map-work, in labeling Canaan. Shown here is the stick-figuring that happen for the first two days. Days three and four also have you working through a few verses of the Bible, and drawing two stick-figure illustrations each day. The fourth day also includes a lesson review, with questions such as "Where did Joseph grow up?" and "What did you learn about God from these verses?" The final day is a chance to illustrate their favorite part so far, and to go over the memory verse. Later lessons all include additional Bible Dictionary work, and some have more detailed map work. I don't have my younger students doing this part, but it is fabulous for the older three (10, 12, 14). I also have my oldest son doing some additional work, reading some commentaries on these verses in some cases, or looking at the differences between various translations sometimes. I highly recommend this in ebook format -- not only is it less expensive that way, but then you can print copies for everyone in your family. If you visit the product page, you can check out a sample. We will do more of these studies. I had forgotten how much we enjoy stick-figuring through the Bible!! Disclaimer: I receivee these ebooks in exchange for my review of the product. All opinions are my own, and receiving complimentary products does not factor in to my opinions. For more about my take on reviews, visit my blog post here.